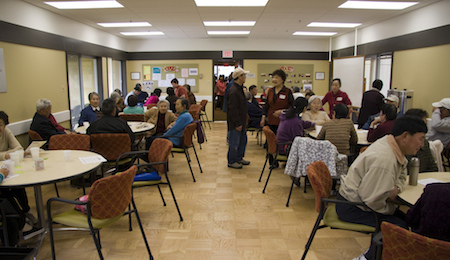 Self-Help for the Elderly currently has 10 activity centers in the San Francisco, San Mateo, and Santa Clara. These activity centers are a place for seniors to enjoy activities with old friends and new friends. We provide them with fun, physical activities that get them up from their seats and up and moving. We promote active and healthy lifestyles for our seniors, so we want them to be up doing something and interacting with other people. During their time at the activity center, seniors will be served healthy meals designed by our nutritionist and caterers. We promote healthy living, so we teach them how to eat healthy and nourish their bodies. Along with teaching them about nutritional foods, we also provide senior living education. We welcome seniors and their spouses 60 years or older. We love meeting new people at our activity centers! Come by for a fun filled day of activities, food, and friends!